The more we learn about Leopard, specifically 10.5.2, the worse it gets. I don’t think there are any larger lessons to be drawn here, or meaningful platform discussions to be had. I think you should find a workaround and keep making music. 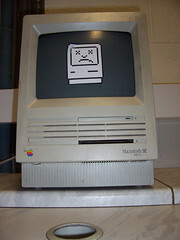 Hey, I’ve been running Mac, Windows, and other operating systems (cough, yes, DOS) for a long time. Some releases are beloved keepers, rock-solid models of compatibility and stability. Others, you move on, and try to erase the version number from your mind. Both seem to come in cycles. I certainly can’t recommend Leopard in its current state. If it’s working for you, fantastic. But if you can otherwise avoid it for the time being, I think sticking with your current OS could be a smart move, especially since there’s no real music-specific reason to upgrade. Hopefully a fix is coming soon; maybe 10.5.3 will appear tomorrow and we’ll be rocking out without bugs for Memorial Day Weekend. We’ll see. This does illustrate the problem — to some, the changes in 10.5.2 were a fix. The issue is, because of the complex, interconnected nature of an operating system, a "fix" can simultaneously be a "break." Being careful with updates is, therefore, par for the course. We’ve already seen official statements from Serato and Native Instruments suggesting users avoid the update, citing similar symptoms to those above. We’ve heard from users using products from other vendors finding other problems. It’s not just music users complaining — you can read reports from the Mac faithful complaining about the update. Unfortunately, new Apple hardware comes pre-loaded with the update, although your best bet is to just try it and hope for the best — we’ve heard from readers that new Penryn-based hardware seems immune to audio performance issues for some reason. I wouldn’t even bring it up, except to say, let’s all agree now that that’s ridiculous. The changes in Mac OS came from other areas of the OS, not from the audio team. Music developers report that they’re working directly with Apple engineering to fix the problem. Apple doesn’t benefit from stuff being broken, period. And Apple doesn’t even make audio hardware. I think people may just be in denial about how hard it is to develop a desktop OS, and how easy it is for problems to occur, particularly with audio subsystems. So, uh, relax, okay? Unfortunately, the reality of OS development is that it’s a delicate thing, and fixing one thing can indeed break something else. So, at this point, we’re waiting on 10.5.3 or some other update to resolve the problem. Now, could there be some kind of engineering and testing effort that makes these problems happen less often on operating systems in general? I’d like to think so, particularly with the rising importance of audio in general computing and the growing significance of so-called "pro audio" (read: sound that works) to Apple’s business, not to mention Apple’s strong track record in the past. I imagine that improving the situation will require effort from both the OS and the developer side. It’s an issue we’ll be watching in the coming months. Mac OS X 10.5.2: Music and Audio Problems on Apple Laptops?